In order to to feel comfortable, your air conditioner will need to be operating efficiently during this part of the season because the air contains an abundance of humidity. 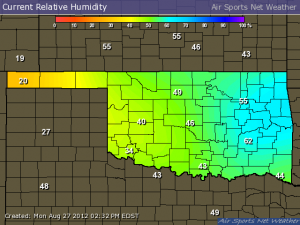 With the recent rains over the past week, the air will contain even more humidity than normal. This humidity and the mid 90’s temperatures will combine to make it uncomfortable outside and just as uncomfortable inside if your air conditioning system is not working correctly. When your air conditioning is working properly and running efficiently, you can expect it to help control both your inside temperature and humidity. You can easily see this by the condensation that drips from the air conditioning unit in the window or the drain tube from outside of your residence. This condensation is the moisture being removed from the air inside of your home and before it enters you home. It stands to reason that an air conditioner that is operating efficiently can more effectively remove the humidity from the air inside of your home. An air conditioning system that is working properly will cool the air and remove the humidity but only if the controls are set correctly. To remove the uncomfortable humidity from the air while your air conditioner is in the cooling mode, you will need to lower the thermostat a few degrees colder than you normally would. Lowering the temperature setting will cause your air conditioning unit to cool the air to below the dew point of the outside air. Since cool air does not hold humidity very well you can expect less humid air in your home. The drawback to this method is the air inside of your home may become colder than you want. Circle B Mechanical suggests that when the temperature feels comfortable but the humidity is extremely high, the dry setting should be used. On the dry setting, the air conditioner will be working to remove the uncomfortable humidity and not trying to cool the air as much. You will notice that the dry setting will cause the air conditioning unit to cycle more often and the fan speed will be noticeably lower as well. However, if the temperature is uncomfortably hot along with high humidity you should use the cooling setting on your air conditioner for more effective temperature and humidity control. Circle B Mechanical has certified and experienced air conditioning specialists that can install, maintain, and repair any model and brand of air conditioning. If you have a humidity problem, we can check your air conditioning system to ensure the quality and condition of the air in your home or business is where it should be. For the best air conditioning service in the Tulsa area contact Circle B Mechanical at (918) 367-6298. This entry was posted in Air Conditioning and tagged Air conditioning service, energy efficiency, humidity. Bookmark the permalink.